To be perfectly honest, I don’t really understand the principles behind Feng Shui. I’m lucky to get my clothes picked up off the laundry room floor much less arrange my couch in a positive energy-flowing location. Feng Shui literally translates “wind” and “water.” Both are associated with good health. There are many who strongly believe in this life-giving system. Retail store which includes consignment store Feng Shui tips abound. Many of them were quite surprising to me. I’m giving you 10. 1.) Never use fluorescent ceiling lights. They cause headaches and fatigue. Your store should be bright and well-lit equally in every area, but the correct bulbs are necessary. Proper lighting balances the “chi energy” in your store. It’s recommended that you have full-spectrum lighting which mimics natural outdoor lighting. Your second choice is LED. 2.) Create a focal point for your shoppers immediately when they enter. Use color, signs and lighting to draw the eye to one area. A main focus eliminates confusion and distraction. The shopper doesn’t feel overwhelmed. There is air to breathe. 3.) Don’t place a mirror facing the front door. According to the spruce, “the mirror pushes away all the good feng shui energy that is about to enter …” It is believed that a building absorbs it’s energy through the front door. If necessary, angle the mirror slightly to increase good consignment store Feng Shui. It’s highly recommended that you place your cash register in an area of lucky consignment store Feng Shui. However, you first have to know your “kua number.” Oh boy, this is where it gets difficult. 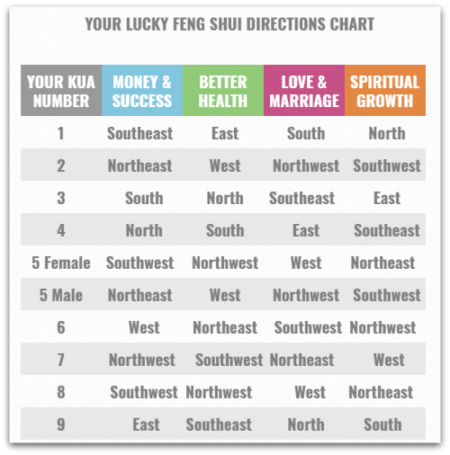 So, knowFeng Shui.com offers a chart to help you figure out what your number is. It’s determined by the year you were born…according to the Chinese New Year. It turns out my Feng Shui kua number is 6. I’m not sure why, but that makes me feel very lucky. 4.) Place your cash register, according to the chart below, in the luckiest place if you’re seeking money and success (and who isn’t?) Locate it in the diagonal corner from your front door based on your lucky number. This will give you a better quality of energy. 5.) Direct door alignment is also a no-no. In other words, don’t allow your back door to be in direct alignment with your front door. 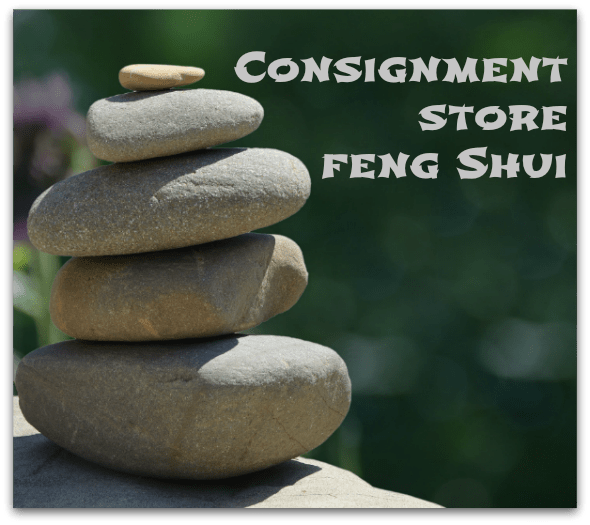 Since consignment store Feng Shui is all about the movement of energy, having your 2 doors aligned means that the energy (like water) would flow in one door and out the other. Use tall plants, a round table or other piece of furniture, or even painting the front door a stronger color than the back door as simple techniques to improve your store’s Feng Shui. 6.) Create good energy through a good emotional feeling. Having a good flow of fresh air, a lively scent, soothing music and comfortable lighting can lead to a good emotional feeling. Shoppers buy based on emotion, so make sure this one is properly taken care of. 7.) Create pathways to explore your store. Your customers should feel as though they are on a journey. Arrange your merchandise so that it’s surrounded by open spaces and separate your beautiful, brightly colored items so the eye can rest. For more tips on store design read, 6 quick and easy changes that will improve store design. 8.) Take a good look at the outside of your store. “A strong flow of Feng Shui energy is created by a strong and clear presence, which includes a clean, crisp store name, well-lit, and fresh window displays, as well as by using appropriate colors,” thespruce adds. Make sure there is a clear pathway to the front entrance of your store. 9.) Place the name of your store inside. Everyone shopping should know where they are at all times. Your signage should be high and in a well-lit area. 10.) Finally, bad Feng Shui also comes from lack of order. This extends from your sales floor all the way to your stock room. Clutter should be removed from every area including your cash register, sales floor, back room and even the waste basket. Shoppers should never feel overwhelmed by “too much stuff.” Good Feng Shui comes from peace and organization.